Traditionally life science and medical endoscopy have turned to the broadband light sources such as mercury, metal halide and xenon lamps to fulfill their demanding illumination requirements. With recent advances in light emitting diodes, these applications are now replacing traditional lamp-based light sources to take full advantage of LED technology. While standard LED sources are fully adequate to cover most of the spectrum required by these applications, specific wavelength requirements in the “green gap” require a clever approach with LED to generate sufficient optical power to effectively image samples. This article explains how innovative and advanced LED technology developed by Excelitas overcomes this challenging wavelength gap that lies between 540-590nm. Fluorescence excitation in microscopy has traditionally been driven by the spectral properties of the mercury arc lamp, which has defined the chemistry of fluorophores, as well as the excitation and emission filters used in most fluorescence imaging. 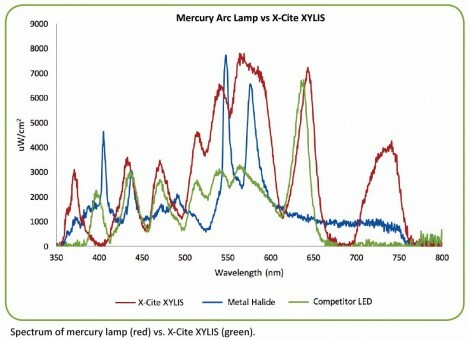 The mercury arc lamp has discrete peaks around which the most common fluorophores such as DAPI, FITC and TRITC have been developed and used for decades. With illumination technology moving to LEDs, users must be aware of the differences in the peak optical power between lamps and LEDs and ensure optimization of their filters to achieve maximum excitation efficiency of their fluorophores. Endoscopy instrumentation uses xenon lamps to view human tissue. Due to the spectral breadth of xenon and uniform excitation across the spectrum, it has been the “gold standard” in endoscopy and surgical visualization. Customers are now demanding LED replacements due to technological advantages including longer life, lower power requirements and smaller size. To meet this demand, light source manufacturers must ensure that LEDs used for endoscopy illumination can cover the RGB (red, green, blue) components of the spectrum, which creates the “bright white light” desired by the operator or surgeon in endoscopic imaging environments. 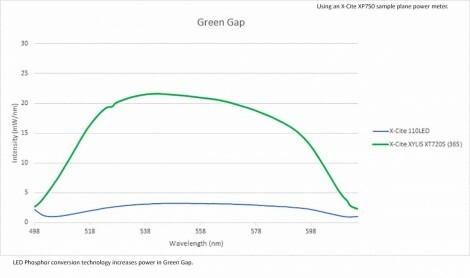 This application, too, suffers from the LED green gap challenge, which needs to be overcome in order to get the green part of the spectrum at acceptable power. Manufacturers are challenged by designing fluorescence LED illumination systems that cover the same spectrum as traditional lamps for fluorescence excitation or medical visualization. The challenging wavelength band is between 540-590 nm, known as the green gap. LEDs in this region of the spectrum are fundamentally limited by the lack of semiconductor materials to efficiently emit light at this wavelength. Some manufacturers have arrived at innovative solutions to bridge the gap, including LED arrays, wavelength conversion phosphor technology and integrated laser solutions. Wavelength conversion using phosphor materials has been used in the lighting and projection industries for several decades. Shorter wavelength light (blue, violet, UV) is absorbed by a material that re-emits light of a longer wavelength via phosphor conversion. Excelitas Technologies uses patented laser phosphor conversion technology to generate high-power light in the 540-590nm region. Excelitas´ LaserLED Hybrid Drive combines laser and LED technology to generate high-power excitation light. The resulting solution overcomes the green gap by using high-efficiency blue lasers to excite a phosphor layer, generating a broad peak from 500-600nm, which can then be filtered to a more specific excitation band, depending on the molecule to be visualized. With increased power in the 500-600nm region using LaserLED Hybrid Drive, the exposure time required to obtain a good fluorescence signal or image is dramatically reduced when compared to other LED green gap solutions. This translates to higher throughput potential and more efficient sample processing. To successfully take advantage of LaserLED Hybrid Drive, the resulting illumination systems take into account all thermal, electrical and optical parameters to maximize light conversion and delivery of light to the sample. The LaserLED Hybrid Drive has the ability to be more efficient than other phosphor conversion techniques and was recognized with a 2016 Microscopy Today Innovation Award. In application, combining LED, laser and phosphor technologies effectively bridges the green gap. In microscopy and analytical instrumentation applications, a researcher or clinician may need to excite several fluorophores in a sample. This would include DAPI, FITC or GFP, and a red fluorophore such as mCherry, TRITC or Texas Red. Traditionally they would be able to excite these dyes efficiently using an arc lamp that has a nice peak in the 550nm region and another at 580nm. When technology in microscope light sources originally moved to LEDs in the early 2000s, the green gap was a challenge with no solution. This caused users to either continue using mercury lamps or use LEDs for other fluorophores and switch to lamps to fill the green gap, which undermined the whole purpose of switching to LED if the user still had to turn on their lamp for these challenging fluorophores. With LaserLED Hybrid drive, the user has a full optical spectrum required to excite all their common fluorescent proteins and fluorophores with one light source. 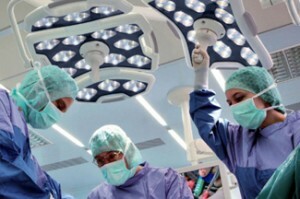 In medical applications such as endoscopy and surgical visualization, the surgeon requires “white light” in order to image internal anatomy. 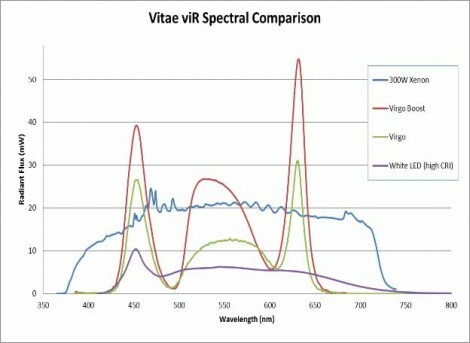 Xenon has always been the reference for the shade of “white” in subsequent technologies. Replacing xenon with a “white LED” with a fixed shade of white (color temperature) is a successful alternative for those who want longer life than lamps provide. For more advanced applications, surgeons want the ability to change this color temperature to suit their definition of white or adjust it for their cameras. This is possible by using separate RGB LEDs in order to create white. Having separate LEDs allows the surgeon to alter the levels of each color to create the desired color of white. Using the three LEDs allows for this color mixing, but the green gap issue limits the surgeon´s color mixing due to the low green intensity. Here again, we have used LaserLED Hybrid drive to increase the power in the green, allowing the surgeon a larger range of color tenability. LaserLED Hybrid Drive allows for superior illumination uniformity and maximum light delivery at all wavelengths including the challenging green gap. This enables users in microscopy and endoscopy to visualize molecules with LED illuminators as they would with traditional lamp technologies without any compromise.